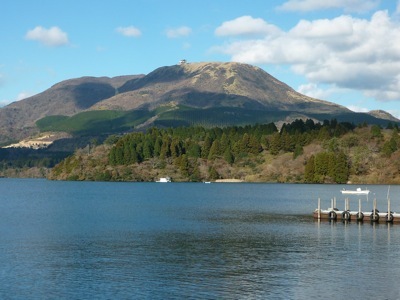 It is said Lake Ashi is the most beautiful lake in Hakone. 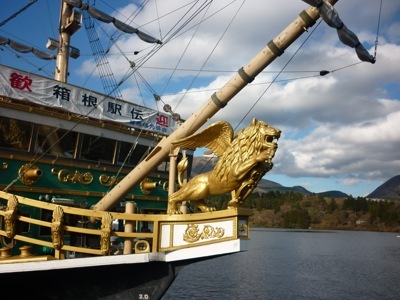 We took a cruise on Lake Ashi for about 10 minutes. The ship is in the shape of a pirate ship. You can feel the peace and laid back lifestyle here in Lake Ashi. Over here, it is one of the best places to see Mt Fuji though it is a bit far. 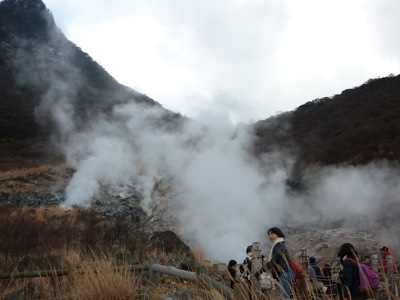 Owakudani (大湧谷) means Great Boiling Valley. As the name depicts, it is a place where volcanic activities are pretty much still alive. 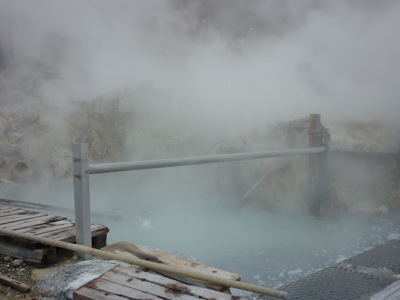 Boiling water underground with strong sulfurous steam coming out of the ground. It smells like a dirty toilet, if you don’t know what sulfur smells like. The valley stands at 1,050m and the hiking trails lead you to the highest point – which takes about 15 minutes’s hike. 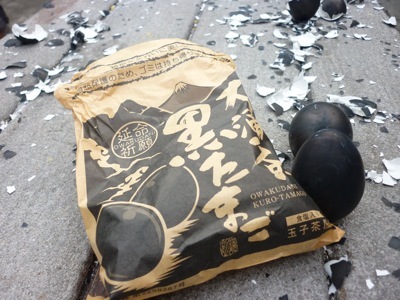 The specialty of Owakudani is you can enjoy volcanic boiled black eggs here. You can get them at a shop at the top. 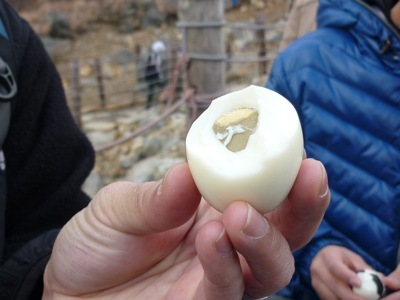 Though you can get the eggs at the foot of the mountain but it is said the eggs are fresher up there. The eggs are sold at ¥500 for 5 eggs. We tried the eggs, they tasted just the same as any other boiled eggs. To add more flavor, you can add in the salt provided. It is a belief that if you take one of these eggs, it can prolong your life for another seven years. Cool right? Note: This article is part of Our Japan Trip series.